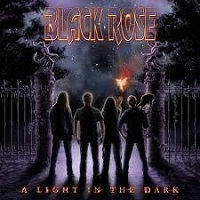 Black Rose is a Swedish band that formed a little over two decades ago. This band know how to rock out. Their new album is “A Light in the Dark” . The first track is “Sands of Time”, which begins like a church choir and is beautiful in every way possible. Then it goes straight into an upbeat tempo of rock gloriousness. The lyrics of the song are good and deep, it speaks of battles long ago and it begins the story of the album. Time is important and so are memories. Memories of good times and bad time are important. That is what is to be noticed from this song lyrically. The guitar solo is killer! The song overall is a wonderful melodic way to begin this album. “Carry On” a guitar heavy song that is unbelievably riveting. This heart pounding song will have one singing along while head banging. Jakob Sandberg has the voice of a demonic angel that will make one fall in love with him. It is a song that has a positive message. No matter what happens in life, just carry on. In the craziest way, it all works out in the end. Hang in there. Track number five is also the name of the album. “A Light in the Dark” a hard driving song that happens in the middle of the album that brings it all together. A throbbing drum throughout will set one’s soul on fire. The quick breaks that leads into a great guitar solo is something that will burn your ears, but in a good way. “Ain’t Over til it’s Over” a good song. The voice of pleasure vocally with good lyrics. Don’t give up, it is all good. Good musicians just playing good music. Guitarist pay close attention, one can learn a lot just by listening. This is wonderful and melodic. One of this writer’s favorites. The last song on “A Light in the Dark” is “Love into Hate” with amazing drums in this song. The quick beat of the drums will be memorable. A great song that is bringing a masterpiece to an end in the best way possible. Lyrically, musically, and vocally everything works. This is one of those albums that one will listen to over and over. The guitar solos alone will be listened to by many with great enthusiasm. The album as a whole will make one pay attention and will make one have a head banging time. Keep rocking BLACK ROSE!